2016 is well underway and this is the second newsletter to date. As in the previous newsletter, we have an experimental section of patent applications recently published at the European Patent Office of interest for our readers. These selected patents could suggests certain areas of research or could show how research has (potentially) found its way into everyday life. One of our readers attracts our attention on the incoming Virtual Reality (r)evolution, what could mean for researchers rather than consumers. Another reader proposes a new website with interesting job offers (see below and in the EUCASS website in the job offers section). In the meantime, please find some info about interesting publications that have been released since newsletter #15. Please note that we will shortly update our main website moving to another CMS. Surely the new website will be up before next newsletter/announcement, make sure of visiting it from time to time. Kosarev, V. F. and Klinkov, S. V. and Zaikovskii, V. N. and Kundasev, S. G.
Dyachenko, A. Yu. and Smul’sky, Ya. I. and Terekhov, V. I. and Yarygina, N. I.
Boiko, A. V. and Dovgal, A. V. and Sorokin, A. M.
Gatapova, E. Ya. and Filipenko, R. A. and Lyulin, Yu. V. and Graur, I. A. and Marchuk, I. V. and Kabov, O. A.
Tsoi, A. N. and Pavlenko, A. N.
Kuznetsov, V. V. and Shamirzaev, A. S.
Garyaev, A. B. and Prun, O. E. and Klimenko, A. V.
Karchevskiy, M. N. and Tokarev, M. P. and Yagodnitsyna, A. A. and Kozinkin, L. A.
Nizovtsev, M. I. and Borodulin, V. Yu. and Letushko, V. N.
Semenov, A. A. and Feoktistov, D. V. and Zaitsev, D. V. and Kuznetsov, G. V. and Kabov, O. 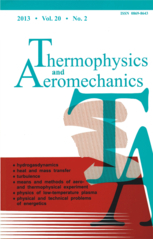 A.
Anshakov, A. S. and Urbakh, E. K. and Cherednichenko, V. S. and Kuzmin, M. G. and Urbakh, A. E.
The toc for this last issue N.4 is reported below for your convenience. Jeon, B.-J. and Bang, J. and Park, B.-G. and Ahn, J. and Tahk, M.-J. Wang, Y. and Guo, H. and Yang, H. and Liu, R. and Deng, Z.
Guo, S. and Lu, H. and Gao, N. and Liu, J. and Wu, C.
Woodiga, S. and Liu, T. and Ramasamy, R. V. and Kode, S. K.
Kang, S. and Wang, J. and Shan, J.
Lu, Y. and Ma, X.
Sheng, S. and Sun, C.
Wang, R. and Xiong, Z. and Liu, J. and Shi, L.
Zhong, W.-J. and Wang, J.-S. and Ji, W.-J. and Lei, X. and Zhou, X.-W.
Ming-Zhou, G. and Guo-Ping, C. and Ying, N.
Chen, Z. and Qu, Y. and Liu, B. and Bo, Y. and Fu, M. and Chen, J.
Qian, Y.-J. and Liu, Y. and Zhang, W. and Yang, X.-D. and Yao, M.-H.
A few issues have been released since the last time our newsletter wrote about this journal sponsored by the International Academy of Astronautics. The last volume, currently in progress, is number 122 and it is due for May/June 2016 (see journal page here). Nurge, Mark A. and Youngquist, Robert C. and Starr, Stanley O.
Seriani, S. and Brama, Y.L. and Gallina, P. and Manzoni, G.
Anselmo, L. and Pardini, C.
Cordelli, E. and Vananti, A. and Schildknecht, T.
Guarnaccia, Leone and Bevilacqua, Riccardo and Pastorelli, Stefano P.
Kaur, Jasmeet and Rickman, Douglas and Schoonen, Martin A.
Dong, Gangqi and Zhu, Zheng H.
Islamov, R.R. and Gusev, О.А. and Tanabe, A. and Terada, M. and Tyapkina, O.V. and Petrov, K.A. and Rizvanov, А.А. and Kozlovskaya, I.B. and Nikolskiy, E.E. and Grigorjev, A.I. Catauro, M. and Bollino, F. and Papale, F.
Spencer, David B. and Shank, Brian S.
Prévereaud, Y. and Vérant, J.-L. and Balat-Pichelin, M. and Moschetta, J.-M.
A reader points out that a wide variety of Aerospace jobs in UK is available at the Neuvoo website: he himself found his current position thanks to this website. We dutifully pass on the information. One of our readers is pointing out that this 2016 is shaping as a big year for Virtual Reality, at least from a consumer perspective, see for example this article here. What we (as scientific community) hope to gain from this consumer VR (r)evolution is a similar effect to the one seen for the evolution of graphic cards for games that has led to the development of GPGPU computing. GPGPU computing is not the panacea for all kind of simulations, but with ever more increasingly powerful GPGPU units, and, most importantly, with rethinking the problems in increasingly distributed and parallel terms, the speed-up that can be obtained are more and more difficult to ignore. GPGPU acceleration is available for many kind of scientific software, both in closed and open source variants, and it is an area of extremely active research that is bringing fruitful advancements. While it cannot be stated with certainty, it is difficult to object to the statement that a lot of R&D of GPGPU has been sponsored directly by the consumer market related to the gaming oriented GPUs. See on the topic a relatively old (2010) but still interesting presentation of Nvidia (a key player in the market) here. What can be the side-benefits of the VR (r)evolution? It is easy to imagine that manufacturing, designing and drawing could benefit immensely from a more immersive technique. Scientific visualization could evolve beyond cave like environments and already many researchers and developers are exploring ways to exploit the new hardware and software that will soon be available in the coming months. Consider for example some papers available from the WEVR 2015 : 1st Workshop on Everyday Virtual Reality and in particular this one. It is difficult to know in advance if this time the announced "revolution" will have success. Sometimes new technologies trumpeted as revolutionary have an abysmal success (think of 3D televisions). What experts think will make or break this new vague of VR devices are spatial audio (think Head Related Transfer Function audio), latency, spatial tracking and most importantly, applications, and, probably, games. After all, already in 2015, the gaming industry was bigger then Hollywood. The following patents have been selected from the EPO database using the following criteria: "APP = rolls royce aerospacelab_12_2014 aerospacelab_AL09_2015 aerospacelab_AL09_2015.out AND PUA12 >= 20160101". In this case, this means all patents whose A1/A2 documents have been published after the fist January 2016, filed by a subsidiary of the Rolls Royce group. Since patents can be filed towards different organizations, sometimes the data available in the EPO database (the version available for free online) is not the most complete. In that case an external link is used (for example the first item in this list).